The Days of Johann, an agility dog! : Take Johann's Toofer Challenge! This month, February, is National Pet Dental Health Month - a great time to remember how important it is to take care of our teeth - or as I like to call them toofers - because our teeth are very important to us pups! Did you know that "more than 80 percent of dogs and 70 percent of cats show signs of oral disease by the time they're three years old. This can lead to serious health problems," explained Dr. Brook Niemiec, a board certified specialist in veterinary dentistry. Dr. Brook recommends to, "make sure every veterinary checkup includes a thorough inspection of your pet's teeth and gums, and a discussion on how to keep them healthy and clean between visits." I challenge you to make sure that your pawrent brushes your teeth every day during the month of February. What will this do? It will help your pawrents and you get in the good habit of brushing your teeth often, and cut down on that stupid oral disease stuff that our Docs talk about! And I bet we'll all have much better breath too - and be able to give lots more kisses to our Moms and Dads. And what will I do? If you decide to sign up for Johann's Toofers Challenge, leave a comment on this post to let me know you're participating. We'll post your pic, your name and link back to your blog - so we can show everyone your pearly whites! And be sure and grab one of these buttons to add to your blog (and link back to my blog) to show your support for healthy toofers for all! We'll have lots of updates throughout the month with pics, and all kinds of info, so stay tuned! So whata ya say? You up for a challenge? Get started and leave me a comment today! Look for signs of tooth decay and oral disease by inspecting your pet's teeth regularly. Bad breath, discoloration and tartar are all indications of problems that could lead to serious health risks with the potential for not only damaging teeth and gums but internal organs. Regular visits to your veterinarian should include a complete checkup of your pet's teeth. Your veterinarian should clean plaque and tartar off your pet's teeth if necessary. When tartar—created by the mixture of food debris, saliva and bacteria in the mouth—is allowed to build up it can accumulate between teeth and gums causing tooth loss, and result in an infection that could enter the bloodstream and spread to the heart or other internal organs. Brush your pet's teeth daily or at least weekly. While most dogs or cats will not immediately accept a dental hygiene regimen, it can be successfully introduced with patience, particularly if you start when the pet is young. To acclimate your pet to dental health, start slowly using plenty of praise and treats. Begin at a time when your pet is relaxed and massage the outside of their mouth with your finger. Then give them a taste of pet toothpaste—poultry-flavored is the most popular—and then slowly introduce a toothbrush to their teeth. Begin brushing in short intervals, working up to about 30 seconds a side. Dogs don't accumulate as much tartar on the outside of their teeth as they do the inside, so focus your dental hygiene attention there. Here's a video on how to brush your dog's teeth from Reesa. Nice job Reesa! Looking for more great info on keeping your dog's teeth looking and chewing their best? Visit my Squidoo Lens! Marley and I accept your challenge. Her toothbrush is ready for doggy toothpaste. Yeah Marley and Mum - Glad to have you aboard! I accept your challenge! Though I'm not a pup, I take care of them every day! Every grooming client that walks through my door will get a free toofers brushing, k? Thanks for the idea, Johann! Hey you FOUR - that's gonna be a lot of toofer brushing at your house! The Canine Mafia accepts your challenge! We'll have the whitest teefies on the block! Oh no!!! After jie jie read your post, she was reminded that she hasn't clean my teeth for a while. She went strait to the shelf where MY supplies are kept and brought out the scaler, tooth brush, toothpaste and a plastic cup filled with water as well as my detal care gel. I was made to lay on the bed so that she run the scaler through my teeth, brush them and applied on the detal care gel. I was TORTURED for a FULL 30 MINUTES!!! We think it will be interesting to start a "Cleanest Teethie" contest where those who take part have to show a picture of their teeth condition now and take your challenge then show their teeth condition again by the end of the month and the pup who got the most improved teeth win a token or an special award to be displayed on their blog. What do you think? I wanna wanna wanna join! Though I am not too keen on the idea of getting my toofies brushed everyday for one month! But I think I'll get used to it. Our teefies get brushed once a week or sometimes once in every two weeks or sometimes less but nonetheless, they get brushed & that's why our toofies are shining white! Well except for Faith's back molars. She never opens her mouth except when she's panting in the heat & that's why they're kinda greenish & her mouth smells. But they are much cleaner now after being brushed with one of those special toothpaste recommended by a petshop! We used it on Joy too. My gosh! When she was taken in by our hoomans on the 1st day, her teefies was so rotting from one end, all the other way around that it looked like they were about to drop off in any minute & her breath stank to high heavens! But after using that toothpaste, her toofies looked like shiny porcelains & before she went to her new home, she only had a little bit left of brownish stuff at the back of her molars. Can you imagine, her toofies were such in bad shape at such a young age? She was only 1 year plus but for all you know, judging from her playful puppy character, she may only be 11 months old but her toofies were rotting away! Yikes! Glad it's better now. So anyway, I just take a picture of mahself getting my toofies brushed is it & pee-mail it to you? pps. mama got a bad sinus infection and she not thinkin right.. Thanks Lacy! Woofs, those sinus infects are nasty - Mum started using a Neti Pot and loves it, got over her's super fast! Hey Amber - it's amazing what some toofer brushing will do. I can't wait to see your pic, send it over and we'll post it, fur sure! Hey Snowball - great idea, send your pics and we'll post 'em! And if others want to do before and afters send your pics too! 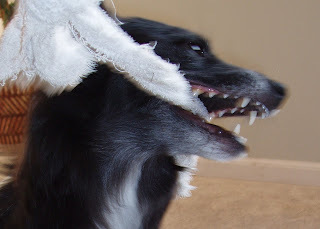 Hey Mary - that's gonna be a lot of toofer brushing around your house with your Mafia, BOL! We are up for your challenge! The 11 month old puppy will be much easier to manage every day! Hooray, I don't have to do it! Ours get a bone to chew on every day so they clean their own teeth. Works wonders for those who don't mind giving their Dogs a bone! I wish I could do this challenge but in fact I (and Dyos) we eat barf and because of this we don't have to brush our teeth. Our vet said that he had never seen such white teeth !!! Woohoo I was so proud. I'm a bit embarrassed to say that we've never brushed our pups teeth. And it showed on Simon and Scarlett in their later years. hello...i vote for your blog on bloggers choice awards 2009.
it will be honour if you would vote for my blog too for foreign language category...success for you! Johann, I have a picture to email to you. I'm joining the challenge! I'll need your pee-mail to email to you.